Throughout the past 170 years, since the Baha’i Faith was born in what was then called Persia, its followers have been subject to often horrific persecution. (Disclosure: I belong to the Baha’i community, though I’m not very good at it.) After decades of relative calm, the 1979 Iranian Revolution not only deposed the Shah but brought Iran’s largest religious minority under renewed attack. Its institutions have been banned despite their benevolence, its leaders executed for “heresy” or other trumped-up charges, its holy places and cemeteries pillaged, and its women vilified shamefully for daring to practise the foundational Baha’i principle of gender equality. In addition, for close to three decades, the Iranian regime has closed the door on qualified Baha’is who apply to university in Iran, solely because of their religion. In response, Baha’i professors fired from their Iranian university positions developed an informal distance-learning program to provide higher education to those deprived of it, which is Bahari’s focus in his film. The film’s publicity photo. Faran, Artin and Kamran are front and centre. Though the degrees obtained are not recognized by the Iranian regime, some Canadian universities have accepted Baha’i students into graduate programs, where they have excelled. Carleton University and the University of Ottawa, whom I write about because of their fine basketball teams, more importantly were among the earliest schools in the world to extend this recognition to Iranian Baha’i students. What’s remarkable, too, is that many of them return home to help with the efforts to train others whose government has turned their learning into a crime. Two of them are at the centre of To Light a Candle. The film begins with two young boys. Keyvan and Kamran were children when their father, a member of the national governing council of Iran’s Baha’is, was arrested in 1983. They never saw him again. As high school graduates, because of their faith, they had no chance to apply to Iranian universities, and so they studied – by mail, by phone, later on the ‘Net, and with periodic travel to major cities to be able to meet with their tutors in person – under professors like Tahereh. She’s a steely woman, beautiful and tough, whom Bahari was able to interview because she had come to the United States for medical treatment, and was never able to return. Her job had been taken from her – as with the employment, possessions and lives of many an Iranian Baha’i – but as she quietly insists in one of the documentary’s many striking moments, “they can’t confiscate education!” Tahereh continues to serve the network of alternative education that she and other Baha’i professors began to organize in the 1980s. After many such interviews, the story returns to the two brothers, and especially to Kamran. He and his wife-to-be, Faran, came to Ottawa to study in the early 2000s along with their friend Mozhgan. They excel, as is typical, in their Master’s studies in educational counselling (nota bene, government of Iran: you need some.) After a Canadian oasis of safe and joyful learning, they go home to give back to the underground system that nurtured their minds. Their fate, and especially that of their young son Artin, is stranger and more piercing than many fictions. One devastating image remains in my brainpan: it is Artin, his parents held in separate prisons after their arrest for teaching the next generation of Baha’i youth, in the care of his grandmother, whose own husband had been executed for “promoting moral corruption” decades before. In the photo, an Iranian public figure, previously an outspoken anti-Baha’i propagandist, has come to realize how he has been mistaken. He has learned of the gentle, responsible and progressive nature of Iran’s largest minority, and become a reformer, and he comes in all humility to express his contrition and ask for forgiveness from one stricken family. He kneels before the child. He kisses Artin’s feet, Artin who is absent a grandparent and both his mother and father, all for these crimes: believing in the oneness of humanity, and working to uplift their society. To Light a Candle is less than an hour long, but it’s still with me. So, too, in the discussion after the film, has Sherri’s story of the dramatically different experiences of high school graduation of her daughter and an American cousin, when compared with a third cousin in Iran whose stress is much less, in a bitter way: she has no educational options at all. Then came another local connection, a retired UOttawa professor of literature, Phyllis Perrakis, who has volunteered for years in the Baha’i education network. “As servants of the scientific and artistic pursuits,” Ms. Perrakis proclaimed to her audience (and, the way I heard her, to Iranian authorities), “we hope that you will walk with us in harmony…and to keep the flame of longing for knowledge alive.” She praised the “detachment, resilience, enthusiasm and gratitude” so regularly displayed by her faraway students, but lamented the self-limiting injustice that, for only one example, confines a talented literature student to being “a truck driver like my father”. Perrakis also quoted another – a young woman enduring slow or absent Internet connections, long bus rides to meet with professors in unfamiliar cities, and the constant fear of being arrested for studying mathematics or poetry in a private home – whose response to the difficulty was simple: “We will never give up!” Winston Churchill, somewhere, is waving his cigar in approval. Mozhgan was the last speaker. She was the third friend who accompanied Kamran and Faran to Ottawa for studies, sharing their happiness and unrestrained learning. On one of her trips back to Tehran, in bitter contrast to the smiling images of a brief Canadian life, she learned that her two friends had been arrested for contributing to the same system that had nourished their own education. Faran was in the same Evin Prison where Bahari had been held and tortured, and Mozhgan was desperate to see her friend. There was no chance of visiting Kamran in his men’s prison, but by some unlikely fluke, she was able to meet with Faran for a short time. Even she could not believe the air of happy resilience that her imprisoned friend radiated, and this story – of but one of the many Baha’is being held prisoner in Iran for the “crime” of education – was a poignant way for the evening to end. But it is in Iran. There are at least two other Baha’is with graduate degrees from Canadian universities who are in jail in Iran. The Islamic Republic of Iran has other methods. As the Baha’i International News Service reports, arrests, attacks on Baha’i-owned businesses, hate propaganda and the destruction of cemeteries have all intensified over the past 18 months.” To Light a Candle and the personal testimonies that followed brought this injustice – repeatedly condemned by United Nations Secretary-General Ban Ki Moon, the U.N.’s Special Rapporteur on the human rights situation in Iran, many government leaders and several Nobel Peace Prize laureates – vividly to the attention of viewers in the hundreds (thousands?²) of worldwide screenings of the film. 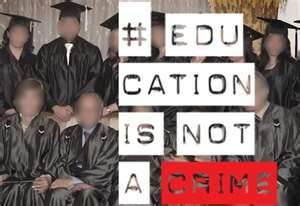 ¹ Archbishop Tutu’s comment is a strong and much-quoted one: “The Iranian government says that education is a crime for Baha’is. We can tell the government of Iran, and the world, that banning the Baha’is or any group from higher education is hurting Iran and the Iranian people.” Go, Des! ² There were nearly 100 in Canada alone. If you missed it, the trailer for the film can be seen here. Sheesh — I *knew* I* was being a tad lazy in the (I don’t have time to) research department, but that wouldn’t have taken much more than a moment’s *thought*. Thanks, faithful reader.